Anyway, I know I said we are not much into eating sweets, that is because of health reasons. The thing is, my husband and I, like, no, LOVE to eat desserts. In fact, he loves dark and real chocolates, he loves my chocolate cakes and cookies specially my brownies. In as much as we want to enjoy these sweet treats everyday, we can't, as these are loaded with sugar making them unhealthy and definitely, will increase our risks of contracting diabetes and other health problems related to the over consumption of sugar. Women with PCOS, like me, are supposed to limit their sugar intake. So, because of that, I've been trying to develop dessert recipes that utilizes the lowest sugar content possible. By the way, my cookies a bit tough and chewy, one reason is the lack of sugar since I used stevia. Another reason is my use of egg whites only (egg whites are tougheners). Next time I'll just incorporate a small amount of sugar and I will use whole eggs instead of just the egg whites. 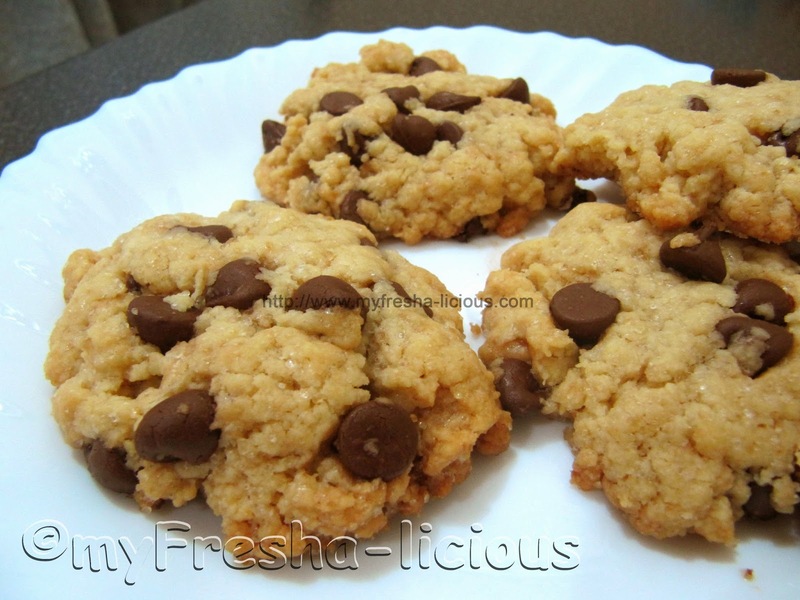 I used Hershey's semi-sweet chocolate chips with this recipe. At the moment, I no longer use hershey's chocolates as I was able to find a supplier of Callebaut and Cacao Barry. They make Belgian and French chocolates :-) and FYI, I use callebaut in my Belgian chocolate brownies. All-purpose Flour - 200 g.
2. Mix the all-purpose flour,stevia, salt, and baking powder together and set aside. 3. Cream the butter and brown sugar together under low speed. Slowly add the egg whites then the oil. 4. Add the dry ingredients in 2 batches and mix under medium speed until fully incorporated. 5. Throw in the almonds and chocolate chips and mix at low speed until just incorporated.